. The rear lights return to the traditional BMW L-shaped design positioned at the outer edge of the back end. The interior continues BMW design by angling the cockpit towards the driver by seven degrees. In the driver’s area all the lines converge on a single point behind the wheel. Positioned on the horizontally-structured instrument panel is the freestanding iDrive monitor. Large drink holders are now integrated into the centre console in front of the gearshift lever. 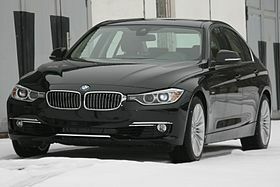 The BMW 3 Series can also be ordered with three distinct design variants. The Sport Line, Luxury Line, and Modern Line features different exterior and interior design elements for each line. Sport Line Sport Line The distinguishing element in the sport line is the high-gloss black that gives a more dynamic appearance to the BMW 3 Series. Eight black kidney grille slats in a chrome-colored surround gives the front end of the car a sporty look. Black inserts in the front apron make the air intake and wheel arches appear larger. High-gloss black painted exterior mirrors and B-pillar and window guide add to the sportier look. Finally a black trim strip on the lower crease underlines the width-enhancing effect of the rear styling along with a black tailpipe. The sporty interior ambiance is expressed by contrasting red and black accents. Red trim rings, red scales in the dials, red stitching on the steering wheel underline the ambiance of the cockpit. The ignition key is also specially identified by its black finish and red detailing.